This quick-drying towel is made of microfiber which have a quick-drying and antibacterial effect. 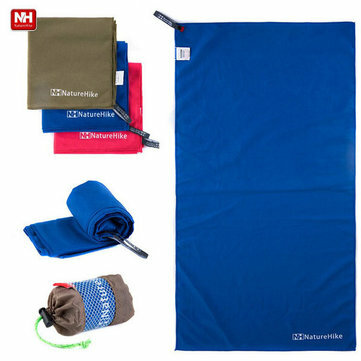 Suitable for bathroom towel, outdoor sports, hiking, travel supplies or etc. 1. Please keep dryness and ventilation, avoid too much moistly, to prevent the bacterium to multiply. 2. Do not bleach, to avoid harm skin health and keep its color good. 3. Towel should be replaced every three to six months - or sooner if the towel become frayed. My daughter likes it to take to the gym, as it is light and compact but still a nice surface. Good quality. This towel does not absorb as much water as a normal cotton towel, but that is pretty much the only downside. This towel is instantly dry just by squeezing it. I bought the big version, and it's just the right size for me when backpacking. It's very compact when folded in the bag. I also like the HellyHansen ripoff-logo hah!